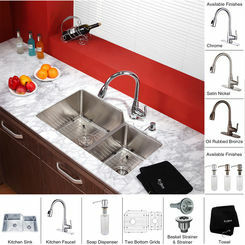 This Kraus KBU14-KPF2230-KSD30CH is a kitchen combo that includes the Kraus KBU-14 one-bowl undermount kitchen sink and the Kraus KPF-2230CH chrome pull-down kitchen faucet. 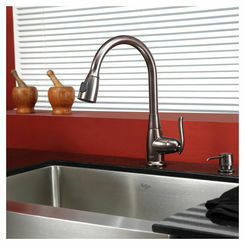 It comes complete with the Kraus SD-30-CH chrome soap dispenser that matches the faucet's finish. Other available finishes are satin nickel (KBU14-KPF2230-KSD30SN) and oil-rubbed bronze (KBU14-KPF2230-KSD30ORB). 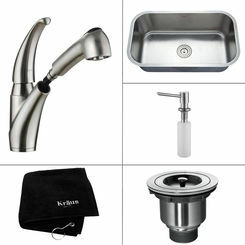 This kitchen fixture includes a stainless steel sink designed for long-term use. It features the "Stone Guard" insulation technology that uses sound-dampening pads to minimize noise. Its sink dimensions are 31-1/2" x 18-3/8" x 10" (refer to the specification sheet to see the diagram). Having a water-efficient faucet that has an economical flow rate of 1.8 GPM (gallons per minute), this product maximizes water use. It features a single lever handle designed for easy operation. 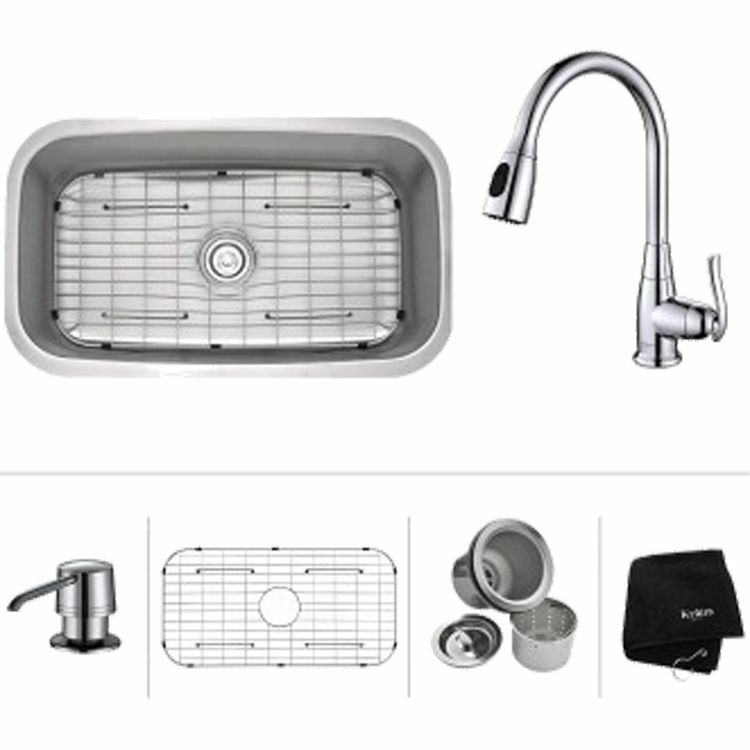 A dish grid, a basket strainer, and installation brackets are included in this package. 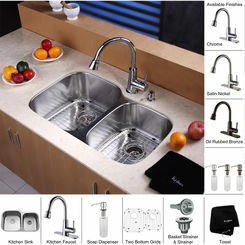 Having a CAL Green-certified faucet and a sink that complies with the requirements set by the ASME A112.19.3/CSA B45.4, this Kraus KBU14-KPF2230-KSD30CH kitchen sink and faucet set has established its safety and quality standards. 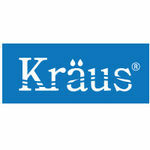 This product is covered by a limited lifetime warranty backed by Kraus, a reliable partner for your home improvement needs. faucet hole size requirement: 1.375"